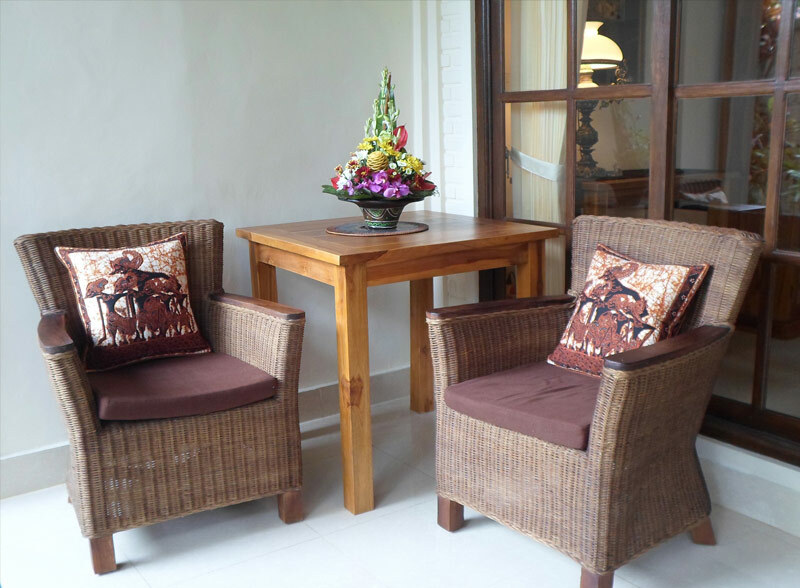 The beautiful villas are grouped in TWO locations within the village of Penestanan – one of the villages which makes up the area known as Ubud, about one hour from Denpasar airport. 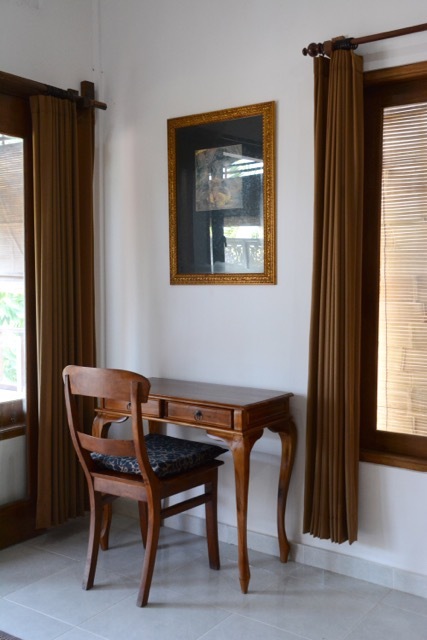 Lily Lane Villas is on the southern boundary of the village (30 mins walk to downtown) and the sister property of Waterlily Villas (formerly Lily Lane Villas II) is closer to downtown Ubud (20 mins walk). All villas suit those requiring short stays but we also offer villas for long term guests; villas for sale and lease; and our Villa Management service for those who would like their own villa but need help to manage it. Lily Lane Villas began in 2009, and is located behind the community area of Penestanan Kelod (sth) near our village temple: Dalem Pacekan and houses Head Office, Reception, Luxe Day Spa, and The Lily Pad restaurant which uses the produce from the extensive onsite organic vegetable garden and orchard at this property. The villas here include: Villa 1 (one bedroom with private pool), Villa 2 (one bedroom), Villa 3 (one bedroom with private pool), Villa 4 (three bedrooms with private pool), Villas 5 & 10 (two bedroom with private pool), and Villas 6 & 7 (one bedroom – no pool). 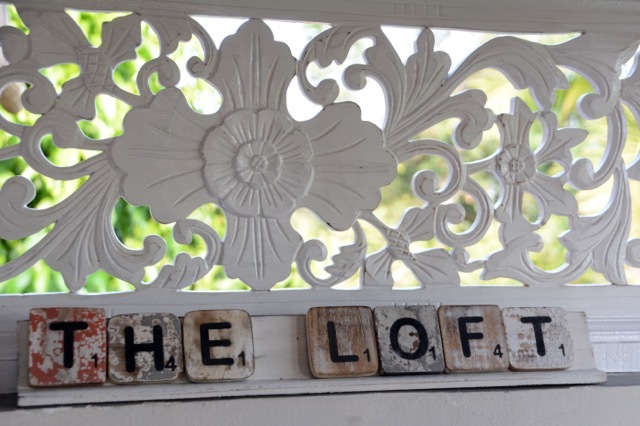 Still under the management of Lily Lane Villas, the sister property of Waterlily Villas (formerly Lily Lane Villas II) began in 2015, with the addition of more beautiful villas across the Beji River. 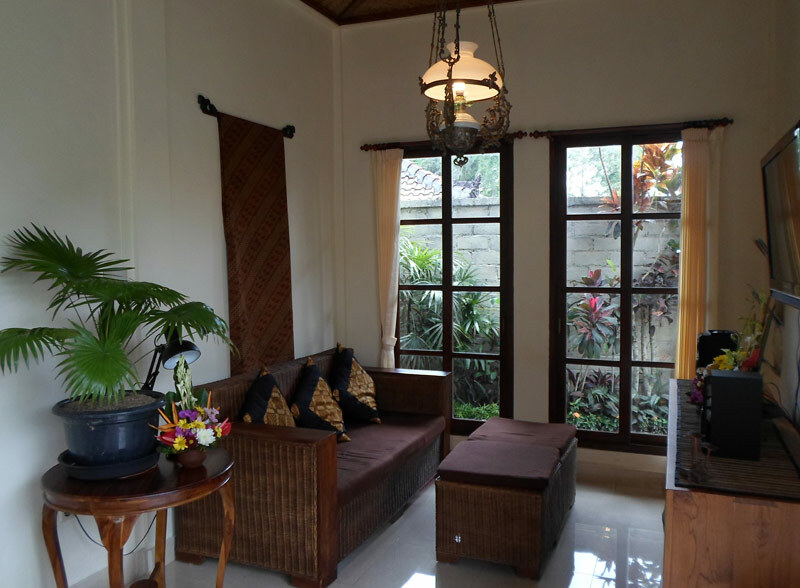 These self-contained villas are closer to downtown Ubud and have restaurants and day spas within easy walking distance. For your convenience, guests are provided with a local phone to keep in touch with our staff. The villas here include: Villa Frangipani – formerly Villa 8 (one bedroom with private pool), Villa Jasmine – formerly Villa 9 (one bedroom), Villa Sita formerly Villa 12 (two bedroom with private pool) and Villa Grandeur (three bedroom with private pool). Life in Lily Lane is guided by the simple philosophy of 'Think Global, Act Local'. This means we made the choice to work, as much as possible, with local families and workers within Penestanan or further afield in Ubud. This supports the sustainability of the local economy. 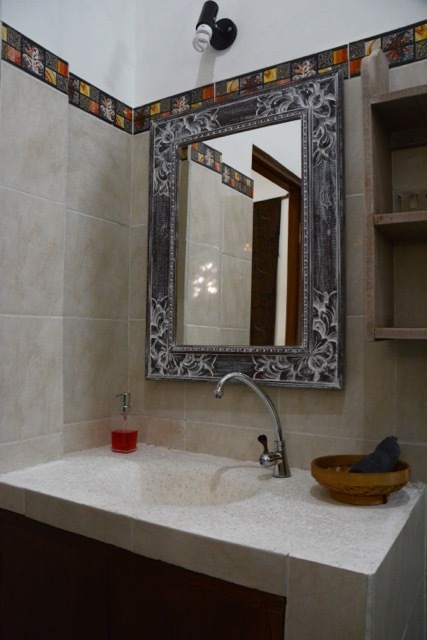 We also are mindful of environmental sustainability through our choice of architect, building design and materials. Our commitment to recycling glass, paper, plastic and aluminium waste also provides income for our families. We are respectful of the Balinese religion which is a combination of Hinduism, Buddhism, Animism and local traditions. Through their offerings, Balinese honor their gods, devils, ancestors and spirits. Every morning, our guests may see a female family member silently and elegantly carrying offerings on a tray with a stick of burning incense, to the holy place of each villa. We require our guests to be quietly respectful of the spiritual beliefs of our staff and their families. Read more reviews of Lily Lane Villas on Trip Advisor. Villa 1 (one bedroom with private pool), Villa 2 (one bedroom), Villa 3 (one bedroom with private pool), Villa 4 (three bedrooms with private pool), Villas 5 & 10 (two bedroom with private pool), and Villas 6 & 7 (one bedroom – no pool). Villa Frangipani – formerly Villa 8 (one bedroom with private pool), Villa Jasmine – formerly Villa 9 (one bedroom), Villa Sita formerly Villa 12 (two bedroom with private pool) and Villa Grandeur (three bedroom with private pool). 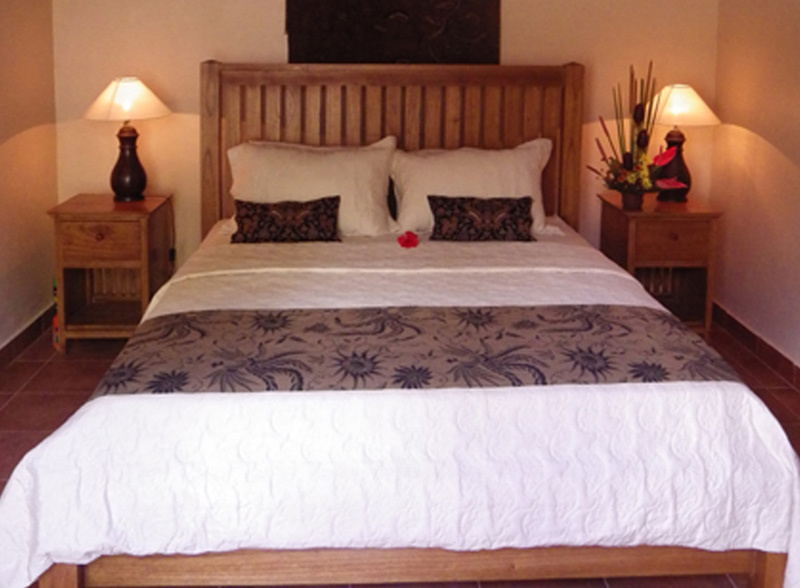 One Queen size bedroom self-contained villa with private pool in a beautiful garden setting. A daily free breakfast of fresh tropical fruit or juice; and toast and assorted jams is delivered to your room. Western, Indonesian, Balinese, Vegetarian cooked breakfast options are also available to order at a cost. 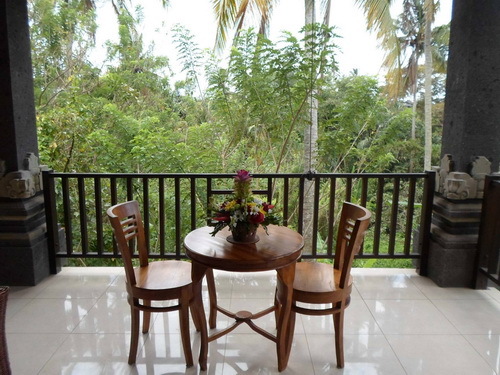 A spacious and private one king size bedroom upstairs villa with beautiful views over food garden and rice paddies. A spacious and private self contained one bedroom with king size bed and private pool. 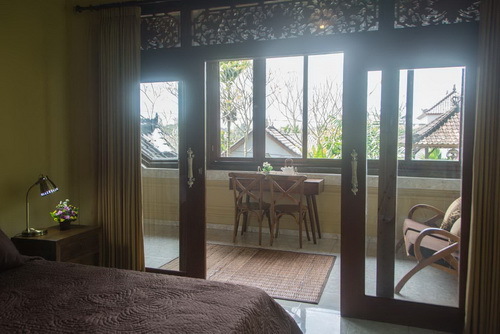 One Queen size bedroom in a self-contained villa with kitchen in a spacious upstairs loft overlooking a beautiful garden with views to the distant rice paddies. A daily free breakfast of fresh tropical fruit or juice; and toast and assorted jams is delivered to your room or you can enjoy dining in The Lily Pad. Western, Indonesian, Balinese, Vegetarian cooked breakfast options are also available to order at a cost. 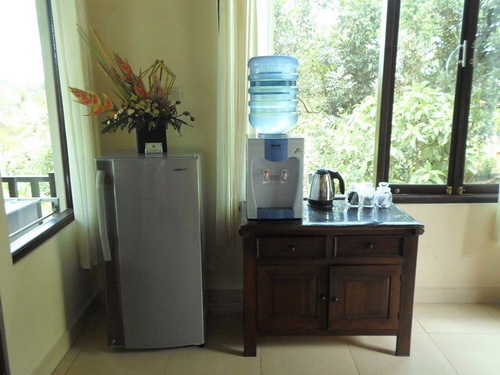 Fully equipped kitchen with fridge,toaster, stove, hot & cold running water; filtered drinking water, tea and coffee. A spacious and private two storey, 3 bedroom self-contained villa with private pool in a beautiful walled garden. A spacious and private two bedroom self-contained Villa with private pool in a beautiful walled garden. 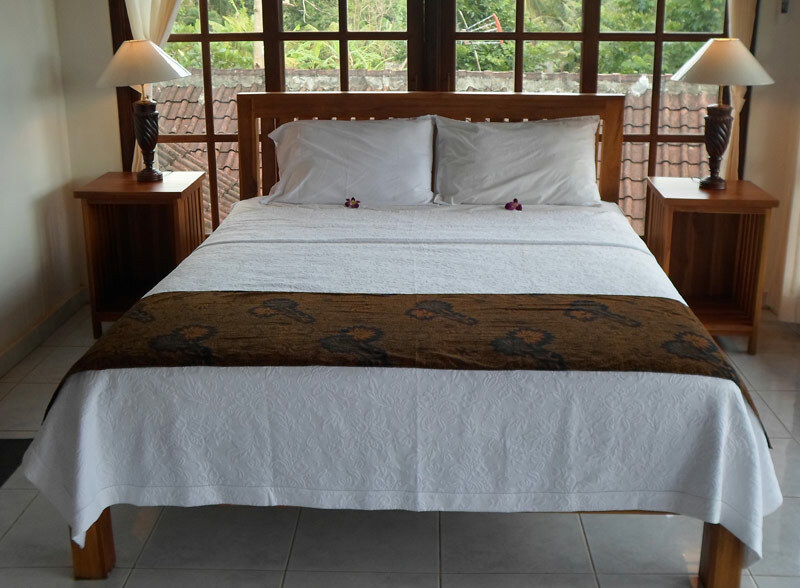 A semi-detached villa includes 1 King bedroom with air-conditioning, bathroom, kitchen; and dining & living area on the verandah overlooking a central garden courtyard. Extra bed not available in this villa. A daily free breakfast of fresh tropical fruit; and toast and assorted jams. 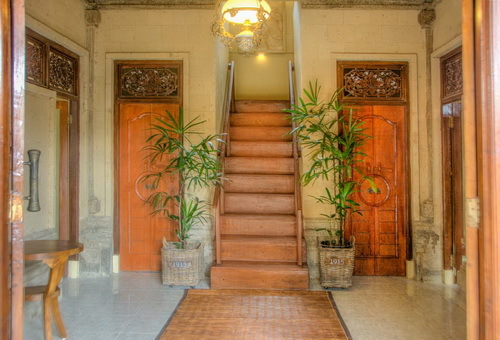 is located nearby to the main Lily Lane Villas property. 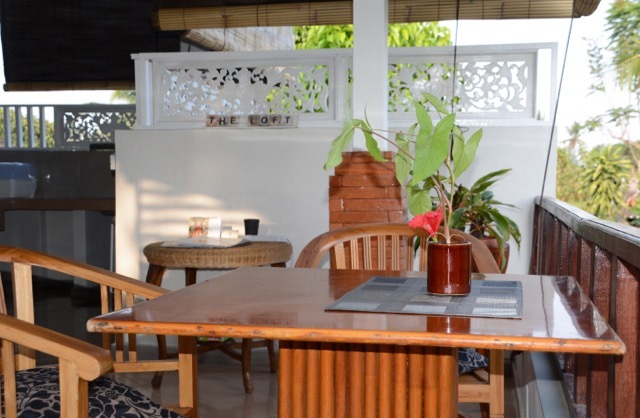 A self-contained one bedroom villa with private pool in a beautiful spacious garden setting. 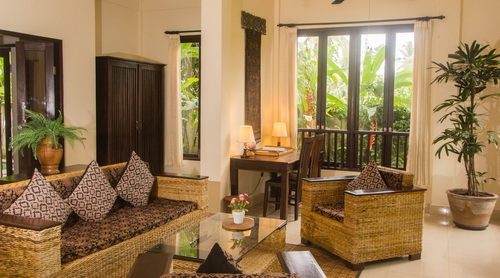 A spacious and private one bedroom villa set in a private walled garden with restaurants, spas and rice paddies within easy walking distance. An exceptionally elegant three bedroom/three bathroom heritage two storey villa with private pool in a beautiful large walled garden. 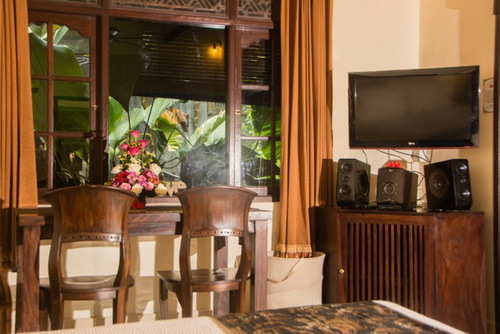 We are located a short 2km from Ubud centre.